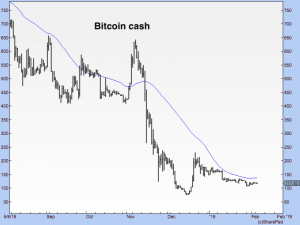 DOMINIC FRISBY: "The action of 2019 has been low in volatility, typical of one of those quiet periods Bitcoin goes through before fireworks come back into the market. The trend is down. It is typical grinding bear market stuff"
Hello and welcome to another of these missives in which we study the price action of various major cryptocurrencies. Bitcoin itself currently stands at $3,420, giving it an overall market cap of $60.67 billion. 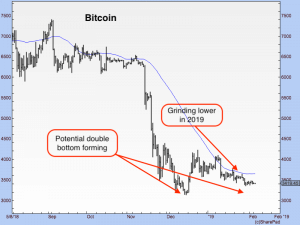 The action of 2019 has been low in volatility, typical of one of those quiet periods Bitcoin goes through before fireworks come back into the market. The trend is down. It is typical grinding bear market stuff. The case can be made that Bitcoin is setting up to retest the December low at around $3,100, but on lighter volume. If it holds, that would be a bullish development. It means we have a nice double bottom. I’m not holding my breath, but there is a potential low-risk trade here for bottom-fishers: buy here and put your stop just below the old lows, perhaps just below $3,000. Here’s the chart. The blue line, as ever, is the 55-day simple moving average (55DMA). It’s flattening out, but it’s still sloping down and the price is below. In other words, it’s a downtrend, folks. 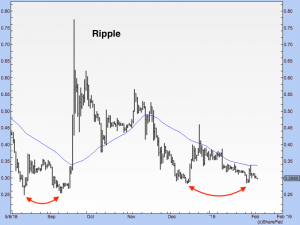 Next up, we have the second most valuable coin by market cap, the mystery that is Ripple. You can explain it to me as much as you like, but I still don’t get it. Others do, however, and their opinion counts much more than mine. That’s why Ripple has a market cap in the billions – $12.3 billion to be precise. The current price is $0.29. Looking at the chart below, you can see, first and foremost, a very clear downtrend in play since that September spike to $0.79. However, there are also signs of a double bottom, as identified by the curving red arrows. If you ascribe to fractal patterns theories – that market price action repeats – you might make the observation that this double bottom is not unlike the one we saw back in the autumn. In any case, there is another bottom-fisher-type trade to be had here: to buy with a stop just below the recent lows. Here’s the chart. The blue line is your 55DMA. It has flattened out, but you want to see the price above not below it, as is currently the case. Ripple’s close rival for “second coin” status is, of course, Ethereum. Its current market cap is $1 billion shy of Ripple at $11.3 billion. $107 is the price. Oof. This is what a downtrend looks like. On a positive note, the 55DMA is flattening out and sloping up slightly, but the price is below. 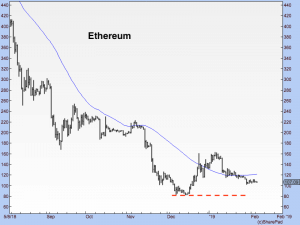 $80 – where I have drawn that dashed red line – is the line in the sand for Ethereum. If you put money into an ICO that raised its money via Ethereum, you had better hope the company cashed out. Otherwise, anything they raised is worth substantially less now. At $2.40 and with a market cap of $2.1 billion, EOS now occupies fourth spot in the league table. 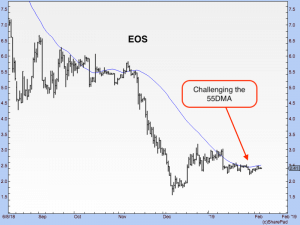 It’s a long way behind Ethereum still, but the price action is marginally more positive. It is, as you can see in the chart below, mounting a challenge to its 55DMA, and it’s quite a lot higher than its December low around $1.55. The jury is still out on this one as far as I’m concerned, but you can say it looks rather better than the others. Continuing down the scale, Bitcoin Cash is next (price $1.18, market cap $2 billion). It’s tracing out a pattern typical of the weaker coins. 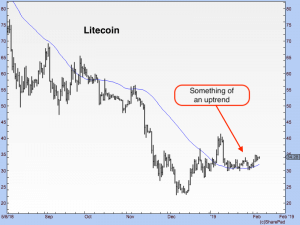 Litecoin (price $34, market cap $2 billion) looks a little better, however. Once silver to Bitcoin’s gold, it has slid down the crypto money chain to become copper. Now it appears to have upgraded slightly to, say, nickel. Look at that! It is sitting above its 55DMA, which is sloping up. The 55DMA held the recent test. That looks like the beginning of a trend. It’s the first time that the moving average has been sloping up since February/March last year, and you have to go back even further to 2017 before you see the type of price action we are seeing here. Who’d’ve thought, of all coins, Litecoin – whose purpose seems to be little more than an experimental sandbox for Bitcoin – would be the price leader. It is very early days yet, but what can I say? This price action is promising. Litecoin! Whowouldathunkit? 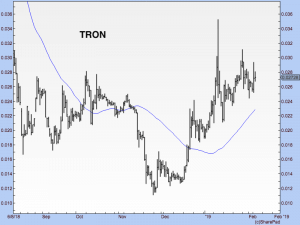 Next we have TRON, the eighth largest coin by market cap (Tether is seventh). Its market cap is $1.7 billion with a price of $0.026. It remains in an impressive uptrend. 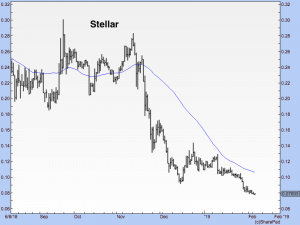 And then in ninth we have Stellar (market cap $1.5 billion, price $0.08). This one has fallen off a cliff and, worryingly, is trading below its December lows. There has been similarly brutal action in Bitcoin SV, which is sitting beneath its December lows as well. So there we go, folks, a few straws to clutch at in this gruelling crypto winter. For now though, we want Bitcoin holding above $3,000. That is our line in the sand. Gerald Cotten dead: Who is the QuadrigaCX founder who died with crypto exchange password?